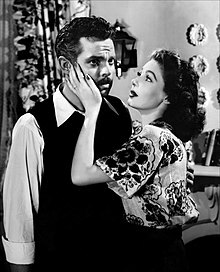 Orson Welles as Franz Kindler / Professor Charles Rankin and Loretta Young as Mary Longstreet Rankin. Edward G. Robinson as Mr. Wilson and Philip Merivale - Judge Adam Longstreet. The Stranger is a 1946 film about an investigator from the War Crimes Commission who travels to Connecticut to find an infamous Nazi. Directed by Orson Welles. Written by Anthony Veiller, Victor Trivas, Decla Dunning, John Huston (uncredited), and Orson Welles (uncredited). The Most Deceitful Man A Woman Ever Loved! Oh, blast all this discussion! What good are words? I'm sick of words. Hang the repercussions and the responsibility! If I fail, I'm responsible. Leave the cell door open. Let him escape. Let him! It's our only chance! Let them threaten me with the bottom pits of hell and still I insist! This obscenity must be destroyed! Do you hear me? Destroyed! In prison, in Czechoslovakia, a war criminal was awaiting execution. This was Konrad Meinike, one time executive officer for Franz Kindler. He was an obscenity on the face of the earth. The stench of burning flesh was in his clothes. But we gave him his freedom on the chance that he might lead me to Kindler. He led me here, Mrs. Rankin. And here, I lost him. Until yesterday. Your dog, Red, found him for me. But unfortunately, Meinike was dead and buried. Now, in all the world, there is only one person who can identify Franz Kindler. That person is the one who knows, knows definitely, who Meinike came to Harper to see. [to Judge Longstreet, about Mary] She has the facts now, but she won't accept them. They're too horrible for her to acknowledge. Not so much that Rankin could be Kindler, but that she could ever have given her love to such a creature. But we have one ally, her subconscious. It knows what the truth is and it's struggling to be heard. The will to truth within your daughter is much too strong to be denied. Why wasn't it I... Franz Kindler? Kill me. Kill me, I want you to. I couldn't face life knowing what I've been to you and what I've done to Noah. But when you kill me, don't put your hands on me! [Picks up a fireplace poker] Here! Use this! Mr. Potter: [after Meineke's body is dug up] I knew darn well it was the same feller. 'Course, he's changed some. Uh, being buried in the earth does it. Professor Charles Rankin: You're not much changed. Put you back in your old uniform, you'd look very much the same. Konrad Meinike: Franz, I am a different man than before. Professor Charles Rankin: I, too. I, too, am different, Konrad. You know how I gathered and destroyed every single item in Germany and Poland that might have served as a clue to my identity. Well, guess what I'll be doing at 6:00 tonight. Standing before a minister of the gospel with a woman's hand in mine, the daughter of a Justice of the United States Supreme Court, a famous liberal. The girl's even good to look at. Yes, the camouflage is perfect. Who would think to look for the notorious Franz Kindler in the sacred precincts of the Harper School, surrounded by the sons of America's first families? And I'll stay hidden... till the day when we strike again. Konrad Meinike: Franz! There will be another war? Professor Charles Rankin: Well, of course. Mary Longstreet: [about Prof. Charles Rankin] Hello, father. Has anybody seen my brand new husband? Judge Longstreet: Don't tell me he's deserted you already. Mary Longstreet: Yes, it looks as if, the brute. Mr. Wilson: Do you know Germany, Mr. Rankin? Professor Charles Rankin: I'm sorry, I...I have a way of making enemies when I'm on that subject. I get pretty unpopular. Mr. Wilson: Well, we shall consider it the objective opinion of an objective historian. Professor Charles Rankin: Historian? A psychiatrist could explain it better. The German sees himself as the innocent victim of world envy and hatred, conspired against, set upon by inferior peoples, inferior nations. He cannot admit to error, much less to wrongdoing, not the German. We chose to ignore Ethiopia and Spain, but we learned from our own casualty list the price of looking the other way. Men of truth everywhere have come to know for whom the bell tolled, but not the German. No! He still follows his warrior gods marching to Wagnerian strains, his eyes still fixed upon the fiery sword of Siegfried, and he knows subterranean meeting places that you don't believe in. The German's dream world comes alive when he takes his place in shining armor beneath the banners of the Teutonic Knights. Mankind is waiting for the Messiah, but for the German, the Messiah is not the Prince of Peace. No, he's... another Barbarossa... another Hitler. Mr. Wilson: Well, then you have no faith in the reforms that are being effected in Germany. Noah Longstreet: There's Marx. "Proletarians, unite. You have nothing to lose but your chains." Professor Charles Rankin: But Marx wasn't a German, Marx was a Jew. Judge Longstreet: But, my dear Charles, if we concede your argument, there is no solution. Professor Charles Rankin: Well, sir, once again, I differ. Judge Longstreet: Well, what is it, then? Professor Charles Rankin: Annihilation. Down to the last babe in arms. Mary Longstreet: Oh, Charles, I can't imagine you're advocating a Carthaginian peace. Professor Charles Rankin: Well, as an historian, I must remind you that the world hasn't had much trouble from Carthage in the past 2,000 years. Mr. Wilson: Forepaw's muddy. No mud on hind. Dry leaves mixed with the mud. Red must have been digging somewhere in the woods. Noah Longstreet: Have you any idea what for, Mr. Wilson? Mr. Wilson: A body, I think. Meinike's. Mary Longstreet: Why are you packing? Are we going somewhere? Professor Charles Rankin: We aren't, dearest. I am. Mary Longstreet: What are you talking about? Professor Charles Rankin: As a rule, men leave their wives because they don't love them, but...I must leave you because I do. Oh, you won't object once you know the kind of man you've married. Professor Charles Rankin: To killing Red? Mary Longstreet: You couldn't have. It was an accident. Professor Charles Rankin: No, I meant to kill him. Murder can be a chain, Mary, one link leading to another until it circles your neck. Red was digging at the grave of the man I killed. Yes, your little man. Professor Charles Rankin: With these hands. The same hands that have held you close to me. Now are you satisfied to let me go? Mary Longstreet: Mr. Wilson, I've never... I've never so much as even seen a Nazi. Mr. Wilson: Well, you might without your realizing it. They look like other people and act like other people - when it's to their benefit. Mary Longstreet: Why do you want me to look at these horrors? Mr. Wilson: All this you're seeing, it's all the product of one mind. The mind of a man named Franz Kindler. Franz Kindler. Yes, he was the most brilliant of the younger minds from the Nazi party. It was Kindler who conceived the theory of genocide, mass depopulation of conquered countries. So that regardless of who won the war, Germany would emerge the strongest nation in Western Europe, biologically speaking. Mary Longstreet: Did you kill Noah? Professor Charles Rankin: Yes, if he goes to the church and climbs up that ladder! Mary Longstreet:It was I you intended to kill, wasn't it? Mary Longstreet: Why wasn't it I? Franz Kindler! Kill me. Kill me, I want you to. I couldn't face life knowing what I've been to you and what I've done to Noah. But when you kill me, don't put your hands on me! [hands Charles a gun] Here! Mary Longstreet: I came to kill you. Professor Charles Rankin: No, no, Mary, it's you that's going to die. You were meant to fall through that ladder. Mary Longstreet: You're going to fall. I don't mind if I take you with me. Professor Charles Rankin: You are a fool. They've searched the woods. I watched them. Here, like God, looking at little ants. I'll hide in the woods. They won't search there again. In a day or two, they'll be sure I got out of town. Mary Longstreet: When they find me, they'll know you're still here. Professor Charles Rankin: But, darling, you're on the verge of a breakdown. Now you've cracked. Why else would you leave your bed, climb to an empty church tower in the dead of night? Any child could see you'd wind up killing yourself. Killing is what led you here. It won't help you now. Mr. Wilson: Look out the window. Look! Professor Charles Rankin: Well, that's... that's an old trick, Mr. Wilson, a very poor trick. Mr. Wilson: Tricks. That's all you know is tricks. I don't need any tricks! And no matter what happens to me, tricks won't do you any good. You're finished, Herr Franz Kindler. Mr. Wilson: The citizens of Harper, they've come after you. The plain, little, ordinary people, the ones you've been laughing at, Herr Franz Kindler! Well, you can't fool them anymore. Oh, sure, you can kill me, Mary, half the people down there, but there's no escape. You had a world and it closed in on you till there was only Harper. That closed in on you and there was only this room! And this room, too, is closing in on you! It's not true, the things they say I did. It was all their idea. Professor Charles Rankin: I followed orders. Professor Charles Rankin: I only did my duty. Don't send me back to them. I can't face them. I'm not a criminal.